IT'S a long time, 862 days. That's the length of time it took Bundaberg's Mia Pearce to fight cancer. It was on the youngster's second birthday when her parents knew something wasn't right. "She woke up the day after and refused to stand or walk so we took her to the doctor," Mr Pearce said. "We only suspected that she hurt her foot or leg, never that it would be linked to cancer." The family of three was flown to Brisbane, where they stayed for 10 months to fight the high-risk acute lymphoblastic leukaemia. It was a long path for the toddler but with Bundaberg behind her she fought hard through the touch-and-go moments. 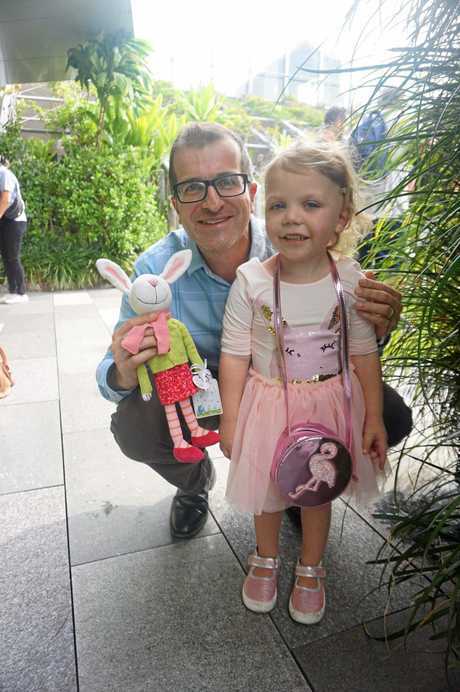 "Mia was either hospitalised or an outpatient for a large portion of that time, and we weren't allowed to be any further than a one-hour drive from the Lady Cilento Children's Hospital, as her condition was quite fragile," her father said. Mr Pearce said Mia was at her weakest was when she battled a fungal infection. "It was New Year's Day 2016 and Mia had a high temperature, and she was hospitalised while blood cultures were taken to find the cause," he said. "She was gravely ill. Mia's oncologist and ICU doctors were extremely concerned, and she fell into an unconscious state for about a week." He said it was terrifying and they were worried they'd lose her. "Rhianne never left her side for almost a month while Mia was hospitalised on that occasion," he said. When asked how they handled seeing their once-lively daughter in this state, they said by putting all their faith in the doctors. "Emotionally, you go on auto-pilot," Mr Pearce said. "It's cliched, but you just go hour by hour, day by day. "I don't know how we handled it, to be honest. You just keep going." The support from their home town helped keep them by their daughter's side and is something they will never forget. "The amount of people that supported, helped and inspired us is just mind blowing," Mr Pearce said. "We could say 'thank you' thousands of times and it still wouldn't seem like enough. "We are very grateful for the generosity of family, friends and complete strangers." It may have taken 862 days for Mia to win the battle, but, her parents said she still doesn't realise the magnitude of her achievement. "Being diagnosed at 2, she really wasn't too aware of what was going on initially, and we purposely kept brave faces and didn't tell her too much about her condition," Mr Pearce said. "We didn't want her to know she was sick or see us upset, we wanted her to feel as normal as possible." He said it became so normal for the now four-year-old that when she recently questioned another child in the park about blood testing. "One day at a park recently, she went up to another kid and asked them 'what day is your blood test?'" Mr Pearce said. "It became that normal for her that she thought everyone had to have them." 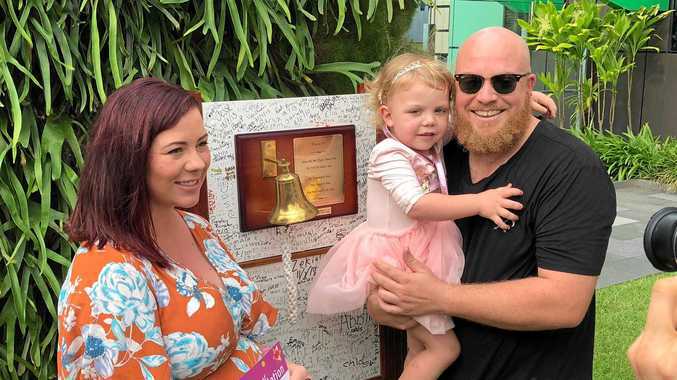 Last week Mia Pearce went back to Brisbane where she rang the bell, a tradition to signify the end of her treatment and the battle she had fought and won.